Welcome to Slot Games, one of the best places online to enjoy some amazing video slots. We have over 500 slot titles on our website for you to explore and play. It does not matter what tastes you have or whether you only play certain games with specific features. We are going to have something to cater to each and every one of your needs. Our game range includes some of the latest titles from some of the top developers in the industry at the moment. With developers like Barcrest, Microgaming, and NetEnt providing games of all varieties, we are determined to stay on top of the latest releases. For anyone wanting a little change of scenery, we also offer blackjack, roulette, and a great selection of jackpots. What’s more, we are part of the Jumpman Gaming network. The Jumpman Gaming network is a wide family that encompasses many different bingo and slot sites; some of which may already be familiar to you. They help give us an amazing platform to stand on while we help you achieve all that you can through playing our games. To make everything about us just that little bit sweeter, we have a series of amazing promotions for you to take a look. From free spins on classic slots to our cashback scheme to our VIP tiers that can see you rising higher and higher, there are plenty of ways we make you feel like the valued player we know you are. Are you ready to play? Read to find out all about how you can deposit money to play here at Slot Games; and which method we think is the most secure. We know that there are many, many ways to pay for online casinos and people like to take advantage of them when they can. That is why we allow you to add 3 payment methods to your account at Slot Games! Setting up a new payment method is quick and easy to do; the only major thing we ask is that all cards and payments must be owned or in the name of the player who is registered to play with us. Let’s take a look a closer look at the ways you can deposit a payment with us. At Slot Games, we accept Visa credit and debit cards, Maestro cards, and Mastercard. Credit and debit cards are one of the most common ways to pay for things online. Credit cards in particular are a great way to pay for things online but you must make sure that you are not spending more than you can pay off; particularly when it comes to online gambling. Everyone’s favourite online e-wallet is one of the safest and most popular methods of online money transfers. With transactions taking place every day, PayPal offers a great way for you to manage your online financial presence. The paysafe card is a prepaid online card service which has been around since 2000. You buy one from a relevant store and then use it at certain online stores like casinos. With denominations ranging from £10 to £175, it is a great way for you to buy your gambling deposits in nice easy chunks to help you manage how much you are spending on gaming. Pay by Mobile slots are becoming all the more popular as mobile phone usage rises. Instead of paying the deposit when they make it, the amount is added to their phone bill for the end of the month. No money will leave your account until the bill is paid, meaning that you get a little extra breathing space while you play. Pay by Mobile is a fast and secure way of adding a deposit to your balance at Slot Games. Your financial security is our top priority and it is why we have strived to make sure that you will have peace of mind when playing through us. When it comes to the process of Pay by Mobile slots, it is one of the simplest and most secure ways to add a deposit. There is no fiddling around with cards and expiry dates and you don’t need to remember what the password to your PayPal is. All you need is your mobile phone number. When you go to make a deposit, select Pay by Mobile from the options available to you. Enter the deposit you would like to make; here at Slot Games that is a minimum of £10 or £20 if you are looking for a spin of the Mega Reel. Then, all you need is your mobile phone handy. A text will be sent out to the number you gave when you made the account. Enter the code sent to you and the money will be sent to your account! It is that simple. There is a small transaction fee of £2.50 for deposits of £5, £10, and £20. On our end, we use a whole host of data encryption, firewalls, and access control policies to keep your data as safe as can be. As a member of the Jumpman Gaming family, we are also subject to third-party safety and security audits to ensure that we are as safe as can be. You have every reassurance that we are doing everything we can to keep you safe online. Your mobile phone number is amongst this data which we protect. You never have anything to fear; we are never going to pass it on to anyone else in our network or a third party unless they uphold the terms of our Privacy Agreement. The biggest disadvantage of the pay by mobile casino method is the fact that it is not a method which doubles up as a withdrawal method. You will need a second payment method if you wish to withdraw your winnings at any point. A great option here would be PayPal as you are moving it to another secure location before choosing to spend it as either PayPal credit or transferring it on into your personal bank account. Withdrawals at Slot Games take 72 hours to process. You may also be asked to verify your account in this time period, through methods set out by the UK Gambling Commission. When your account is verified and the processing time has passed, the funds will take between 1 and 3 business days to reach your account. Withdrawals less than £30 will also be subject to a £2.50 transaction fee. Everything is handled using the same levels of discretion and security as any other transaction on the site. To find out more about how we handle financial transactions and other matters, please visit the terms and conditions pages of our website. Pay by Mobile has really taken off ever since the advent of smartphones and the ability to do everything from your mobile. 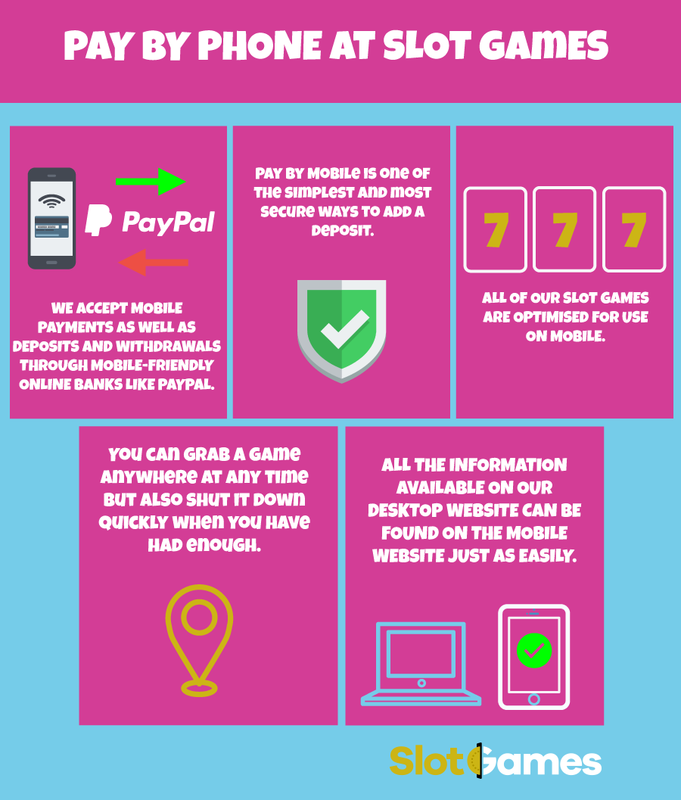 Since here at Slot Games, as well as at other casinos, we are fully optimised for mobile play, it makes sense for you to also be able to pay through the same device. It would be time-consuming to have to log onto a computer just to pay a deposit so we have implemented pay by mobile to make everything run that little bit faster. Since it does not require us receiving any banking details, it is one of the safest ways for you to be able to put money into your Slot Games account. If you want to try paying by mobile today, head to the deposit section of your account and try it for yourself today! What Else Can You Get for Using Your Mobile at Slot Games? There is plenty for you to do at Slot Games with your mobile in hand. We have fully optimised the website for mobile and tablet devices. What does this mean? Surely mobile optimisation is the same as mobile compatibility? Nope! A mobile-optimised website is one which looks slightly different than its desktop counterpart because it has been specially designed to be more mobile friendly. Navigation has been designed for easy scrolling and the buttons are usually larger and easier to press. The vast majority of players access online casinos through phones or tablet devices so it would be foolish of us to neglect all these amazing players’ needs. This isn’t all we offer. The vast majority of our games are available to be accessed from all devices whether you want to play on desktop, tablet, or, of course, by mobile. The amazing game developers out there are constantly on the hunt for new innovations to make the games as brilliant and as accessible as possible. No software to download; all you need to play is money in your account and an internet connection! Here are some of our favourite games to play on our mobiles. Finn and the Swirly Spin – this little gem comes straight from the industry leaders at Net Ent. They are always on the hunt for new innovations they can make and they have got a fantastic one here. Finn and the Swirly Spin is their take on the popular Irish theme that so many slots love. The reels are one creative swirl which leads to four amazing bonus games. Prepare to get sucked right into the Swirly Spin; you are going to want to explore every single facet that this game has to offer you! Lucky Links – a creative number from the minds at Just For The Win. They are one of the smaller and newer slot developers but they are quickly making a name for themselves with their innovative game mechanics and high-quality games. In Lucky Links, matching symbols in adjacent reels have the ability to link together and form massive blocks which can net you a fantastic jackpot. It has an extremely sleek design overall and is a very clever update to the traditional slot machine format. All fans of classically inspired slots should check this game out. Immortal Romance – one for the lovers of all things dark and romantic. This slot has been developed by the industry heavyweights at Microgaming. This creative company has an unbelievable amount of titles to their name and we are always eager to see what they will bring us next. Immortal Romance is based off the vampire craze led by shows like The Vampire Diaries and True Blood. It features an amazing bonus game with lots of separate sub-features as well as a fabulous stacked wild feature. It was one of the UK’s most popular slots when it first launched in 2011. Play it for yourself today to discover why it is still so loved. All three of these games are tremendous fun to play and work just as well on mobile as they do if you play them on a laptop. They are the very tip of the iceberg of what we have to offer you. Whether you are hunting for a Wild West adventure in the Gold Rush or a fantasy escape to a mythical realm, we have the slot to suit; and they are all available for mobile play! Here at Slot Games, we understand that your mobile is one of the most important gadgets you own. That is why we have done everything we can to place mobile functions at the heart of our website. We choose the best games for you to play on whatever device you prefer. We also offer multiple options for depositing money into your account and we think that Pay by Mobile is one of the best. It is safe, it is secure, and you will know exactly how much you have spent each and every time you receive your phone bill. If you think paying your deposits by mobile is an option for you, go set it up now! However you choose to pay and play, Slot Games is here to support you!